Two basic types of meteorological balloons are available from NovaLynx. The smaller pilot (or ceiling) balloons are usually tracked with a theodolite. These balloons are not designed to carry a payload. Three different colors provide easier sighting under varying weather conditions. The larger sounding balloons are designed to carry a radiosonde aloft, and these balloons are usually used in conjunction with a rawinsonde tracking station. They can also carry other types of payload, such as radar targets. 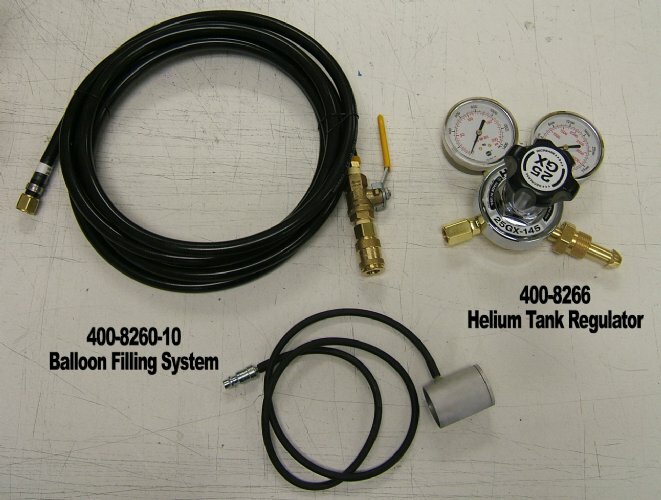 The 400-8200 Series Weather Balloons are produced by rotational molding of natural rubber. Their uniform wall thickness prevents premature blowouts, and they are ozone resistant. Reinforced necks allow use in strong winds without tearing. These balloons are not recommended for tethering. Each balloon is inflated, inspected, and tested before being dusted and sealed in a moisture-proof polyethylene bag. They may be stored up to seven years if kept in a cool, dark room. No preflight conditioning is required. Two basic types of meteorological balloons are available from NovaLynx. The smaller pilot (or ceiling) balloons are usually tracked with a theodolite. These balloons are not designed to carry a payload. Three different colors provide easier sighting under varying weather conditions. The natural color has the greatest visibility on clear days; red is easiest to see in scattered clouds; and black is best for overcast conditions. Small lights can be used to illuminate pilot balloons for easier sighting during nighttime observations. 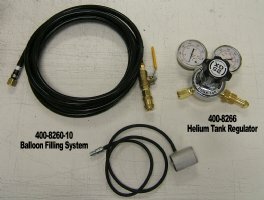 Balloon weight is chosen based on the altitude and ascent rate required. The larger sounding balloons are designed to carry a radiosonde aloft, and these balloons are usually used in conjunction with a rawinsonde tracking station. They can also carry other types of payload, such as radar targets. The burst altitude required should be used to determine the balloon weight needed. Sounding balloons can carry payloads greater than those listed in the chart if the gross lift of the balloon is increased. This is done by increasing the inflation volume. (Note the burst diameter of the balloon to avoid overfilling.) The ascent rate and burst altitude will vary from the values given in the specifications. The following formulas can be used to calculate approximate values. Experimentation will probably be required. Specifications are based on performance tests conducted at the factory. They are taken from hydrogen-inflated balloons. Helium inflation may provide different results.